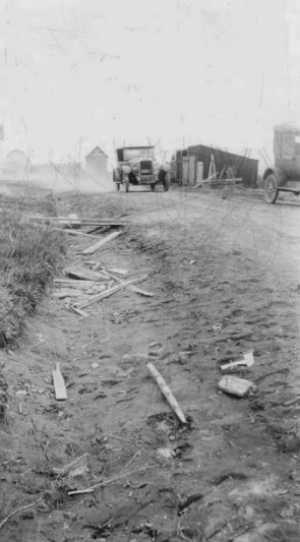 "Bain Township, Aitkin County, Minnesota"
This may have been the old road in Bain. The following was written by Rebecca E. Allen, a resident of Bain, in her diary. It was submitted by Florence Allen. October 12, Saturday about noon the big fire came in on us from the Northwest and we had to fight fire awful hard till Sunday morning but saved our buildings and hay. But Bain burned all but school house and 2 dwellings, Chas Megarry's and Mrs. Harry Boatman's and a small barn of Vance Sherrill's. Mr. Boyd and Young and Maude Young and Mr. Heath of Swatara and Loyd Rulen and Will Rolf and Chas Fisher and a Scoonmaker boy and Fred Ward helped to fight our fire. On 3rd Thursday we had a fire from South that was bad but nothing to the one of the 12th.